This ConturaSeries recessed soap dispenser has a corrosion-resistant valve and dispenses commercially marketed all-purpose hand soaps. 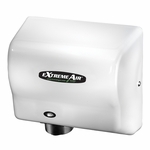 The front of dispenser is constructed of drawn, 20-gauge (1.0mm), one-piece, satin-finish stainless steel. A covered, plastic soap vessel is attached to back of dispenser front.